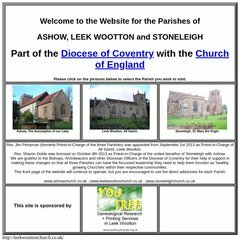 Topics: Who's Who, Baptisms (christenings) And Weddings, Local Businesses, Ashow Church, and Leek Wootton Church. It is hosted by Dedipower Managed Hosting (England, Reading,) using Apache/2 web server. There are 3 Nameservers, ns1.livedns.co.uk, ns2.livedns.co.uk, and ns3.livedns.co.uk. The programming language environment is PHP/5.2.17.